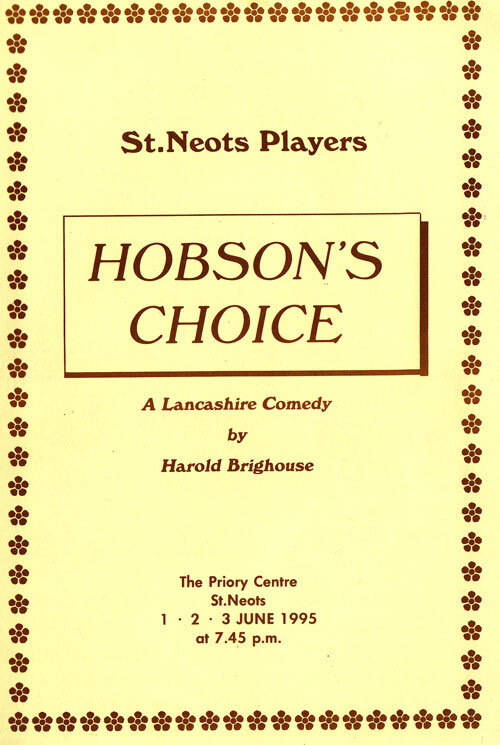 Hobson’s Choice is a play by Harold Brighouse, the title coming from the popular expression, Hobson’s choice — meaning no choice at all. The play was first produced in America, the first English production being on June 22 1916 in London. The story is set in Salford in 1880. The plot revolves around Willie Mossop, a gifted, but unappreciated shoemaker employed by the domineering Henry Horatio Hobson. Semi-literate and content with his lot, he is bullied by Hobson’s eldest daughter, Maggie (over the hill by Victorian terms at the ripe old age of 30), into marrying her and setting up in a shop of his own. Maggie and her two younger sisters Alice and Victoria (Vickey) have worked most of their lives in their father’s store without wages and are eager to be married and out of the shop. Alice is engaged to Albert Prosser, a young up-and-coming solicitor, and Vickey to Fred Beenstock, son of a respectable corn merchant. Between her sales skill and his shoemaking talent, Maggie and Willie’s enterprise is very successful and, within a year, he’s taken nearly all Hobson’s trade. At Maggie’s urging, Willie goes into partnership with Hobson, now an almost-bankrupt alcoholic, on condition that Hobson take no further part in the business.